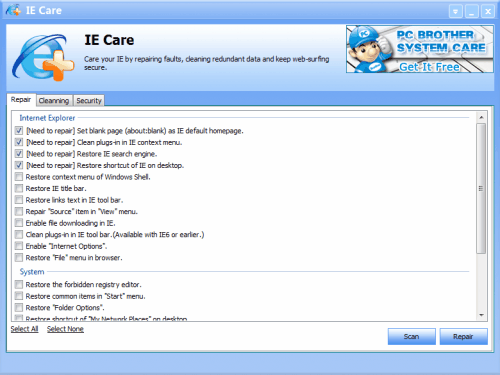 IE Care is an easy to use tool for Microsoft's Internet Explorer. It offers repairing and cleaning functionality, and a so called IE security shield as an additional feature, but more about that later. The program displays three tabs in the main interface on startup that lead to Repair, Cleaning And Security related settings. Both the repair and cleaning section display various items with checkboxes for easy selection. The repair options for instance include fixing the Internet Explorer homepage, restoring the IE search engine, restoring the context menu in the Windows Shell or repairing the source option under the view menu. Each option can be selected separately, and IE Care will furthermore auto check entries that it believes are in need of repair. The cleaning module is basic. It offers to clean the temporary Internet files, cookies, addresses and history. All of which can also be deleted in Internet Explorer directly. Security finally offers to install protection for the Windows Hosts file, so that changes to it are automatically blocked. IE Care is without doubt not the most sophisticated tool to repair or clean Internet Explorer. It is on the other hand easy to use, and offers to resolve some popular issues that IE users may experience from time to time. 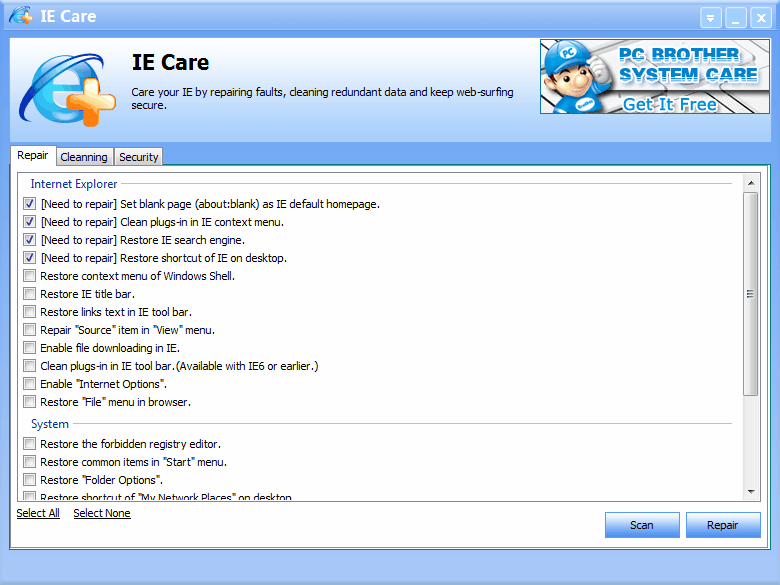 IE Care is available for download at the developer website. Some Windows users may need to install the program with elevated rights. This was for instance the case on our Windows 7 Pro 64-bit system. If you are looking for detailed repairing instructions check out our IE repair guide which gives you all the information you need to troubleshoot and repair the browser if it is not longer working correctly. The guide covers toolbars and add-ons, checking the browser for malicious files and reseting Internet Explorer settings among other things. What would then be the best / recommended tool to fix IE8 on Windows7.